Theater Tickets: Tickets for popular events still are sold out weeks in advance. Most Georgians buy them right at the box office, at the theaters. Nowadays you can also order tickets through the internet. 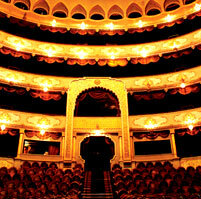 At the Theater: The theater and ballet begin between 19:00-20:00 (7pm-8pm), sometimes as early as 18. Matinees start anytime between 11 and 14. During school holidays, the schedule often changes. Most theaters are closed either on Monday or Tuesday.